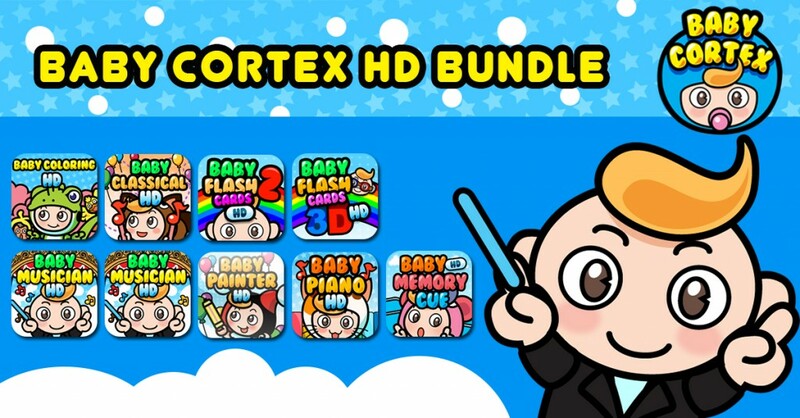 Enjoy this amazing discount deal—Baby Cortex HD Bundle is here! « Pretty Pet Math now available! Now you can get all your favorite HD Baby Cortex apps in a single bundle! Kids learn better when it’s fun! Experience an enjoyable and innovative way to train your kids with these top-notch edutainment apps—all in HD! Baby Flash Cards 2 HD – Enrich your child’s vocabulary in an engaging and entertaining way! Over 250 colorful cards specially designed to make learning new words a fun activity for you and your child. Baby Painter HD – This app allows your child to use the iOS device as a digital painting canvas! Its simple and intuitive interface is sure to provide you and your child hours of fun! Baby Piano HD – Play the piano together with your kid! Cute, colorful interface for your child’s early musical exploration! Baby Classical HD – A music appreciation app that sets out to familiarize children with some of Mozart’s liveliest and most playful pieces! Baby Flash Cards 3D HD – Baby Flash Cards with neat 3D Graphics. Baby Musician HD – Allows your child to play as the conductor of an ensemble of cute animal musicians! The adorable melodies, colorful graphics, and engaging gameplay will encourage your child’s appreciation for music. Baby Coloring HD – An interactive coloring book with an intuitive and easy-to-use interface! Teach your child the basics of drawing and coloring! Baby Memory Cue HD – An adorably cute version of the well-loved classic game of Memory! Flip two identical tiles in succession until you can proceed to the next level. Grab this awesome discount bundle now! Your kids will love you for it. Print article This entry was posted by babyadmin on October 22, 2014 at 6:14 pm, and is filed under Games, iPad, iPhone, News, Uncategorized. Follow any responses to this post through RSS 2.0. Responses are currently closed, but you can trackback from your own site.